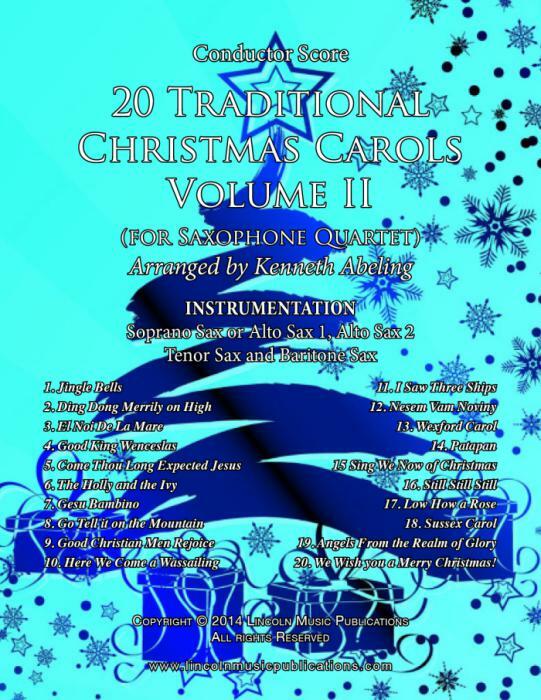 20 Traditional Christmas Carols for Saxophone Quartet Volume II contains 20 more popular Christmas Carols from around the world. Table of Contents: Jingle Bells, Ding Dong Merrily on High, El Noi De La Mare, Good King Wenceslas, Come Thou Long Expected Jesus, The Holly and the Ivy, Gesu Bambino, Go Tell it on the Mountain, Good Christian Men Rejoice, Here We Come a Wassailing, I Saw Three Ships, Nesem Vam Noviny, Wexford Carol, Patapan, Sing We Now of Christmas, Still Still Still, Low How a Rose, Sussex Carol, Angels From the Realm of Glory, We Wish you a Merry Christmas! Both Soprano and Alto Sax for Soprano parts are included for this arrangement.